Lyn Behnke was at a Michigan bazaar in November 2008 when she first experienced a strange pain in her neck that left her stumped. She had her chiropractor friend treat it, and she even tried to treat it herself using acupuncture, with no relief. When she went to her primary care provider the following Monday, she was told she would need an MRI on her neck and a stress test. A cardiovascular nurse practitioner by profession, Lyn hadn't considered that her neck pain could be a cardiac problem. She was aware of her several risk factors, such as being over the age of 50, a smoker, overweight, having a high-stress job, and having a difficult family medical history. Nearly a month after seeing her doctor, Lyn failed her stress test. "That was a bit of a shock," said Behnke. "Even though I did primary care and critical care for years, and I really did know my risk profile, I still didn't feel like it would happen to me." Lyn underwent triple bypass surgery. But, that was only the beginning of her journey. “At the time, I was a 50-year-old woman with heart disease and I’d had bypass surgery and some cardiac rehab and was doing fabulously,” recalls Lyn. On July 2, 2009, after a 10-mile bike, a three-mile walk, and picking dinner out of the garden, Lyn experienced nausea and a full feeling in her chest that wouldn't go away. After driving to the nearest hospital in her rural town, she was diagnosed as having a heart attack and told she had to be transferred to another hospital. She went in for an angioplasty, where her artery ruptured, and she had a near-death experience under anesthesia. When she regained consciousness, she found herself on a balloon pump. Lyn was very ill for quite a few days, but she survived against all odds. When Lyn talked to a second cardiologist, he asked why she had the angioplasty done. She realized the first doctor hadn’t looked at her previous scans for comparison, which ultimately resulted in an incorrect interpretation and wrong diagnosis. Lyn went back to cardiac rehab and has since recovered, with only a few circulation problems in her right leg as a result of the procedures. She knows she's lucky because she had a variety of resources and a network to reach out to during this time. "As a clinician, I see women misdiagnosed all the time,” says Lyn. She believes a large part of the problem is that women have different physiologies and they also have different symptoms of a cardiac event. Unfortunately, much of the current research done is based on men's symptoms. 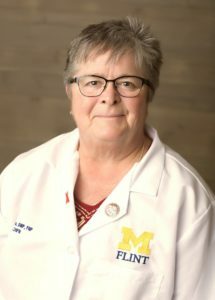 But, as a full-time faculty member at the University of Michigan-Flint's School of Nursing, Lyn does her part by teaching her students to pay attention to a patient's history in addition to their symptoms. Lyn is also on the governing board for WomenHeart and is a WomenHeart Champion. Her involvement in this national coalition of women with heart disease has fueled her passion about proper diagnosis. Lyn's advice to patients is to be their own advocates and to work to establish a better physician-patient relationship. Lyn Behnke is a Patient Partner working with SIDM’s Patients Improving Research in Diagnosis (PAIRED) project, funded by the Patient-Centered Outcomes Research Institute (PCORI). Read her biography. To learn more about the project, contact Sue Sheridan at sue.sheridan@improvediagnosis.org. The Society to Improve Diagnosis in Medicine's (SIDM) Patients Improving Research in Diagnosis (PAIRED) program brings together patient advocates with lived experience and expert researchers to integrate the patient perspective in research efforts.